Pittwater Road and Howard Avenue that will assist flood alleviation within the heart of Dee Why, the suburb in Sydney’s northern beaches where the developer is planning a $300 million town centre. 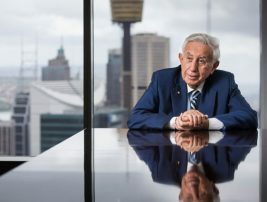 Meriton’s project, which has been christened Lighthouse, is planned on a site bought from Canadian group Brookfield for $52 million in 2013.
beacon in the suburb, with a glass-façade design flooding the apartments with natural light. Meriton says the word lighthouse evokes visions of a coastal setting and a structure close to the ocean. Lighthouse will evolve as a four-tower project with an upmarket retail centre, childcare facilities and commercial suites on the 1.44ha site that previously housed what the local community referred to as Dee Why’s town centre. development site, will include diverting the existing stormwater system to alleviate previous flooding issues within Pittwater Road and Howard Avenue. Work was scheduled to start this week (June 8). Meriton intends that Lighthouse will provide the community with a seamless transition from the retail centre to the council’s new Walter Gors Park, due to be completed in February 2017. 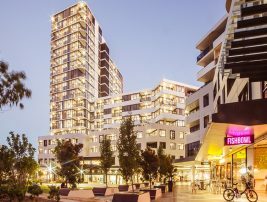 Meriton hopes to start marketing Lighthouse’s 356 apartments in August. It is proposed that the Lighthouse towers, the tallest of which will be 18 levels, will contain 356 one, two and three-bedroom apartments, along with a range of resident lifestyle facilities. parking will cater for both residents and the public.